Laryngoscopy is a process in which the doctor will use a small device to look into the throat, larynx or voice box of the patient. If you experience a sore throat or face problem of coughing, the doctors will use this method to figure out the problem. Are You a Candidate for Laryngoscopy? The person is facing trouble in breathing or swallowing. If they have something stuck in their stomach. If the doctor needs to examine the symptoms of severe problems like cancer. The patient has an earache that won’t go away. 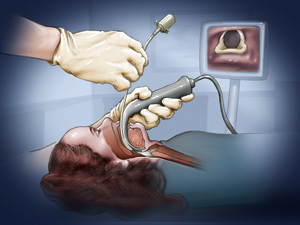 Indirect Laryngoscopy The entire procedure will take about 5 to 10 minutes, and it will be performed in the doctor’s office. This is one of the most popular methods in which the doctor will use a small mirror (the one dentists use, it has a long handle) to throw light in your throat to get a better look. When the doctor shines the light in the mouth, its image will form on the mirror. The doctor might spray medicine in your mouth to numb it before the treatment. Direct fibre-optic laryngoscopy The procedure will take less than 10 minutes in which the doctor will give an anaesthesia to numb the nose. Sometimes a decongestant is given because it opens the nasal passage. This procedure is also called flexible laryngoscopy. The doctor will use a portable telescope which goes up to your nose and goes down to your throat. Direct Laryngoscopy The doctor will use the laryngoscope to push down your tongue and lift the epiglottis. The epiglottis is a thin layer of cartilage that covers your windpipe. While performing this procedure, the doctor will remove the small growths or sample tissue for testing (biopsy). This entire procedure will take about 45 minutes, and it will be performed under local anaesthesia. What are the Possible Complications after the Procedure? There are chances that you might feel nauseated or sleepy after being given anaesthesia. Allergic reactions to anaesthesia aren’t uncommon. Take the prescribed medications on time. If you experience an unbearable pain or persistent fever, immediately contact the doctor. The patient may experience blood vomit, problem in breathing or severe chest pains. The doctors advise the patient to tell any uncommon symptom which may cause problems after the treatment.